Custom Die Cut Gaskets: Mag-Knight Die Cutting offers low cost custom die cut gaskets with no minimums. Our custom die cutting capabilities included manufacturing seals for any industrial, hobby, OEM, military, energy, medical or transportation firm large or small. 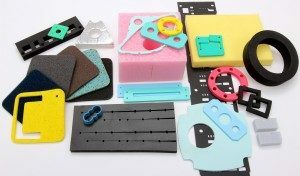 Gasket Materials: There are literally hundreds of substrates including neoprene , silicone, per fluorinated, viton, rubber, compressed non-asbestos, hypalon, etc. If you are unsure as to your application, just give us a call. Die Cutting your gasket using Steel Rule Die Tooling: Once a suitable material has been found, we will work with your design and create a steel rule die. The steel rule die will be laser cut to meet your exact shape and specifications. This tool is purchased once and used numerous times to increase the cost effectiveness of the process. The more times you use the board, the cheaper each of your units will cost. Then we will use your tool to stamp the seal from the material you have selected. 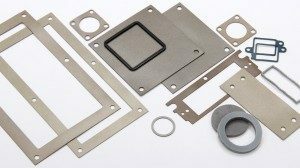 Die Cut Gaskets and Seals Quantities: From 10 units to 10,000, we will offer you the lowest prices and the highest quality product. Our flat bed machinery will produce the exact unit you are looking. For a video demonstration on how your part will be manufactured view our video demonstration to the right. Rubber Gaskets: Neoprene, silicone and foam rubber are the most common type of gaskets. Buna is another common type of gasket material used for use when exposed to oils. We carry various thickness rubber sheets in stock ready for your special requirements. Just give us a call or fill out our quotation form for a response within 24 hours. Fuel Cell Gaskets – We are the leading manufacturer of ceramic felt fuel cell gaskets. Our gaskets seal out air between your cells with the temperature resistance you need. Mag-Knight Die Cutting Capabilities As previously mentioned, our company president will take you step by step through the process and suggest the most efficient methods based on his experience and patented processes. You will pay the lowest price combined with the highest technical knowledge. Please give us a call today to prove our commitment to you! Die Cutting Services environment: All of the products we manufacture require us to have a very clean environment. Since many are consumer products, we must be very careful to ensure that they maintain their perfect appearance. This same careful attention to detail will apply to your job, large or small. Company background: We have been in the business for over 10 years. We strive in providing excellent customer service at rock bottom pricing. How can we do this? Our hourly press time is only $85 per hour. Our closest competitor estimates their jobs at $125 per hour. For proof of this, visit our pricing section. In short, this savings is passed on to you. On top of this, where else can you find a mechanical engineer on staff to help you design your parts? Our company president has a Mechanical Engineering degree from Michigan State University with experience of over 10 years aerospace design and manufacturing at the Boeing Company. If you need the lowest cost service and the highest expertise, you found it right here at Mag-Knight. Tolerances: as close as .015 can be obtained on your custom seal. We strive for the highest quality at rock bottom prices.